“I’m full of joy, redeemed, set free” is the slogan being used by the Evangelical Church in the Rhineland for the 500th Anniversary of the Reformation in 2017. It is taken from the opening lines of a psalm-poem by the Rhineland cabaret artist and writer Hanns Dieter Hüsch (1925-2005). Opening of the new Naomi Project for refugees, with Doris Peschke (CCME, from left) and Kirchenrat Rafael Nikodemus, among others. Going beyond the need for emergency aid, there is now a move to establish ongoing assistance for refugees who are stranded in northern Greece. This is being made possible with support from the Evangelical Church in the Rhineland. The Naomi refugee organisation in Thessaloniki has set up a new project for “action on promoting integration and humanitarian standards for refugees” and this is already well underway. It was officially opened at the end of January 2017 with a celebration in their newly designed premises. The involvement of the Rhineland Church began in 2015 with a call for individual donations and special collections for the emergency aid work of the Naomi project in Idomeni, including among other things a food distribution centre. The new project is “enormously important, because the aim is to go beyond concrete emergency aid towards the integration of the refugees, opening up new prospects for them, whether it be in Germany or in Greece” according to the head of the Department for Migration Affairs, Rhineland Church Council member Rafael Nikodemus, who took part in the opening celebration. He is very happy about the development of the project and described the celebration, which the refugees had helped to plan, as being very impressive and lively. A main pillar of the project is the offer of advice, personal support and humanitarian assistance. This includes individual help for refugee families. The second pillar is made up of measures to promote integration. In practical terms this means language courses in German and Greek, according to where the refugees will be going on to, as well as activities aimed at employment and qualifications, such as a sewing workshop. Naomi is an NGO that has emerged from the German-speaking Protestant congregation in Thessaloniki, led by retired minister Dorothee Vakalis, originally from the Rhineland but now living in Thessaloniki. Co-operating partners in Germany are the Evangelical Church in the Rhineland - which takes the lead responsibility – along with the Evangelical Church of Hesse and Nassau, the Diaconal work in Baden and also in Württemberg, with support from the Churches' Commission for Migrants in Europe (CCME) and the Diaconal work in Rhineland-Westphalia-Lippe. Another important local partner is the emergency aid organisation “Diakonie Katastrophenhilfe”. 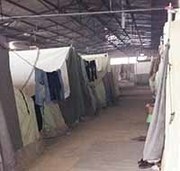 Many refugees remain stranded in Greece under difficult conditions, living for example in tents inside a former factory. 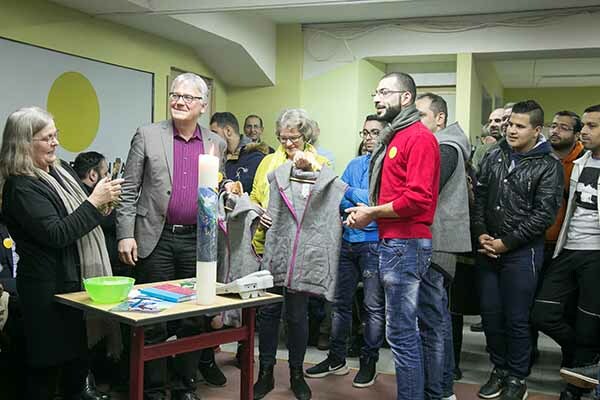 Aid for refugees in Greece is a moving expression of the involvement of people in Germany; in the Evangelical Church in the Rhineland around 257,000 Euros has been raised from donations alone, including on-line donations, and special collections. Additional resources come from the Church Tax. This money goes to the Naomi refugee aid project, to the aid programme of the Greek Protestant Church based at the congregation in Katerini, to the ecumenical refugee programme of the Orthodox Church in Greece as well as to the aid organisation “Apostoli” in the diocese of Athens. The impetus for these various aid programmes arose from a visit in April 2016 to refugees who at the time were stranded in the camp at the Greek village of Idomeni. The President of the Rhineland Church, Manfred Rekowski, said then, with Idomeni in view : “We cannot just accept the catastrophic situation of these people“. All rights reserved. Reproduction only with permission.